Scarlett Blaine's life in 1960s Georgia isn't always easy, especially given her parents' financial struggles and the fights surrounding her sister Juli's hippie lifestyle. Then there's her brother, Cliff. While Scarlett loves him more than anything, there's no denying his unique behavior leaves Cliff misunderstood and left out. So when he wishes for a rocket to Jupiter, Scarlett agrees to make it happen, no matter how crazy the idea might be. Raising the rocket money means baking pies, and the farmer's son, Frank, agrees to provide the peaches if Scarlett will help him talk to Juli. The problem is, Scarlett really enjoys her time with Frank, and finds herself wondering if, someday, they could be more than friends. Just as she thinks everything might be going her way, Cliff suffers an accident that not only affects the rocket plans, but shakes Scarlett's view of God. As the summer comes to an end, Scarlett must find a way to regain what she's lost, but also fulfill a promise to launch her brother's dream. 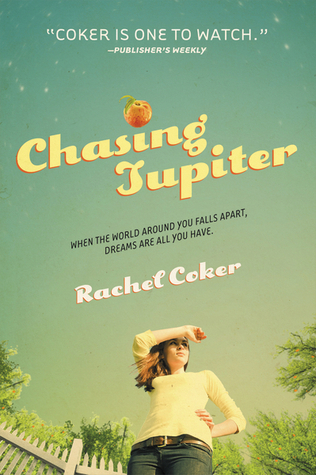 Chasing Jupiter is written by Rachel Coker, a 17-year-old who has written Interrupted: A Life Beyond Words. Coker has a great story line in her resent book Chasing Jupiter, the story is set in the 1960s in Georgia. It's about Scarlett Blaine, a 16-year-old who is growing up in a small town with her family. Scarlett is the shadow of her older sister Juli, who is getting into more trouble and is never home, and her younger brother Cliff, who is autistic. Scarlett takes on all of the household choruses to help her struggling family. She cooks, watches her brother and her grandfather, who is obsessed with peanut butter, she cleans up the house, and tries her best to be the prefect daughter. When Cliff sees Neil Armstrong take his first step on the moon, he tells Scarlett that he wants to build a rocket and be the first man to walk on Jupiter. She promises her little brother that she would help him with his dream and build a rocket with him. During the proses of building the rocket there is a lot of drama and challenges. Juli is getting out of control and is hardly ever home, her parents are not making enough money to feed the family, Grandpop Barley is showing signs of dementia, and Scarlett has feelings for a boy that likes her sister. This coming-of-age book has some parts that are slow in the begging, but it will have a long lasting impression for readers young and old. It tells about a young girl that has to grow up fast to help her family. But in the proses of the story it explains what family really is and no matter what you still do what you can to help. I'm Jillian Lassen, I'm 17 years old and I go to PALCS (PA Leadership Charter School). I'm a cheerleader and dancer; I've been cheerleading since I was about three and I've been in dance for about three years now. I love Batman so much! He's my favorite super hero. I have two older brothers, one younger brother, and a step-sister. My oldest brother is Justin, second oldest is Jeremiah, youngest is Jordan, and my step-sister is Tara. I want to be a dog trainer for people with disabilities. I want to go to Becker College for dog training and then Ohio State for occupational therapy. I love to read and make videos. When I'm not too busy I'm always reading or I making different videos on iMovie. Amazing! I wish I had had the patience and discipline to write a novel when I was a teenager!